If one is talking about best video editing software, Nero Video pops up in mind. Reasons being that it offers a very solid library of templates and themes and also has few of the most advanced features like Ultra 4K HD and video stabilization support that allow you to take the best out of the latest technology. In this video editing application, there are two editing modules which are: Express Editing and Advanced Editing. The difference between these two modules is similar to that between storyboard editing and timeline editing. One major difference in Nero Video is that one cannot switch back and forth between the two modules. So, you can make a project in Express Editing (storyboard) mode and then switch to Advanced Editing (timeline) keeping you project intact. But once you make even a single edit in Advanced module, you are barred from returning to Express mode. This video editing application has a huge list of phenomenal video editing tools which allows you to construct a spell-bounding video. However, its interface, workflow, and the organizational structure are quite confusing and counterintuitive, majorly for users who have some experience with other video editing software. Having said that, once you get mastery on using the tools, they will work well and will yield quite impressive results. It also has motion text effects, disc menu templates, and tilt-shift. Nero provides great online support for Nero Video, but it is somewhat difficult to find – the corresponding support link which is buried at the bottom of the homepage. This link also gives you access to a knowledgebase and a forum of FAQs. The option to call technical support is also available, but it will cost you $1.29 per minute. We would have really appreciated this software if it has provided free technical support. 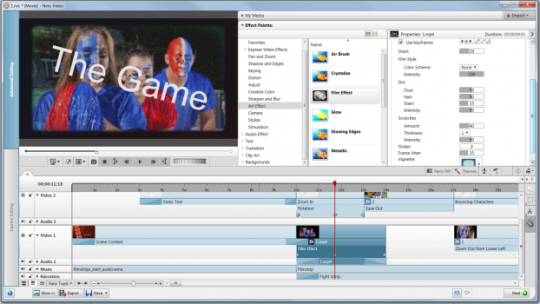 Nero Video is an acceptable option when it comes to video editing software. It offers great tools which allow you to create videos and share them with your family, friends and rest of the world. However, it lacks few of the intuitive usability that segregates good software from the best video editing applications.